If you haven't yet been tempted by Amazon Prime, today the company has added a new Prime perk: Prime Reading. With Prime Reading you have access to a selection of books, magazines, comics and Kindle Singles (short stories from authors including Stephen King and more). It's similar to Amazon's Kindle Unlimited subscription, which gives you access to books and audiobooks for a monthly fee of $10. The difference, however, is the catalog. Kindle Unlimited features more than a million books, a thousand audiobooks and numerous popular magazines. Prime Reading is more restrictive, with just a thousand books and no audiobooks. However, the service does include some compelling titles, like The Hobbit, Harry Potter and the Sorcerer’s Stone, and The Man In the High Castle, with comic collections including Peanuts and Calvin & Hobbes. For magazine readers, there's also a good selection, which may even be more interesting than the limited number of books. Prime Reading offers current issues People, Sports Illustrated, Popular Mechanics and more. If you're considering Prime membership for reading, it also includes the Kindle Owners' Lending Library and Kindle First. The Lending Library lets you read one Kindle ebook per month—from a library of thousands of books—for no additional charge. 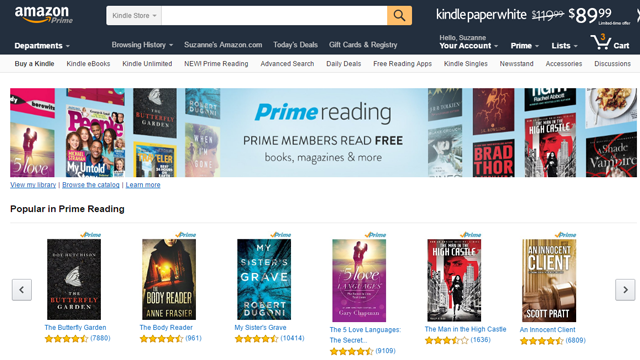 Kindle First offers access to a small selection new titles chosen by Amazon's editors—and Prime Members get one Kindle First title every month for no additional cost. The month's selections may or may not appeal, but it does offer more reading choices. Is it worth signing up for Prime just for Prime Reading? With the fairly small selection of books, maybe not. For serious readers, Kindle Unlimited's larger library is more compelling, though paying for a year of Kindle Unlimited will set you back $120 compared to Prime's $100. But depending on your reading habits, Prime Reading, the Kindle Lending Library and Prime First may offer more than enough books. Another new benefit to Amazon Prime is Twitch Prime, which will appeal to anyone who plays video games. Twitch Prime lets you watch video streams ad-free on Twitch and offers free characters, skins and other bonuses in some of your favorite games. As another gamer perk, Prime members get 20% off video game-pre orders. These are more great perks (if you would use them), but it we also wouldn't say it alone is worth the cost of Prime. However, it's worth remembering that Prime is a package that offers lots of benefits, including free two-day shipping from Amazon, a large library of video and audio to stream, unlimited photo storage and other perks. If you make use of more than one of the features Prime offers, you're probably getting value out of your $100 per year—which averages out to just over $8 per month. That's about what you would pay for a standard definition subscription to Netflix, which only offers video, and less than you would pay for a high definition subscription.